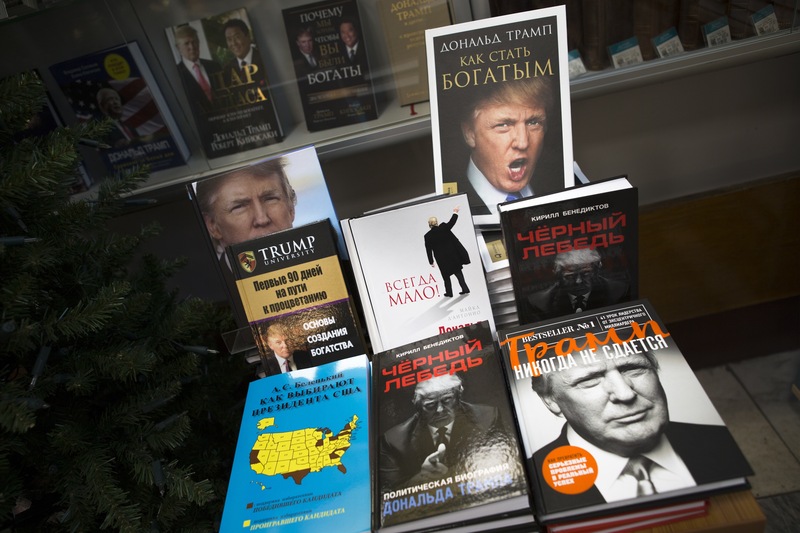 Books by President-elect Donald Trump and about him sit on a display in the Moscow House of Books in Moscow, November 14, 2016. The United States will need to engage Russia, and the incoming Trump administration must determine if it will challenge Russia where necessary. The concern is that the new administration will not rise to the occasion,7 which will hurt U.S. national security interests at a time when the United States can ill afford it. For the moment, the United States seems to have little chance of stopping the Russian airstrikes in Syria.21 U.S. military involvement in Syria is focused primarily on defeating IS,22 along with a Sisyphean effort to find a diplomatic solution, which will not succeed unless the United States can exert some leverage over the Russians. The Kremlin’s refusal to stop bombing civilians and help put in place a consistent flow of humanitarian assistance to civilians in Syria could be a point of leverage for the United States, the United Nations, and other concerned nations to take action against Russia by increasing sanctions or signaling there will be military support for the delivery of aid. Russia’s present involvement in Ukraine reaches deep into Russian history. Modern Russia claims Kyivan Rus’—the ancient federation of East Slavic tribes—as its origin; indeed, Moscow was founded by a prince of Ukraine.33 There has always been a tug of war within Ukraine between east and west. Crimea, which was traditionally part of Russia, was given to Ukraine by Soviet leader Nikita Khrushchev, himself Ukrainian, at a time when the formal relationship with Ukraine made little difference, since both Russia and Ukraine were part of the Soviet Union.34 Putin looked at the potential economic ties between Ukraine and the European Union as problematic and at Ukraine’s push to join NATO as a threat.35 Putin does not want the European Union intruding into the post-Soviet space. Russia uses media sources such as RT, a Russian television network, and Sputnik, a Russian-state-sponsored news source, to slant the news.61 These more mainstream sources of news in turn provide information that can be used and twisted by those websites that ignore the facts in order to create fake news and advance conspiracy theories, including sites such as Infowars.62 Other sites such as WikiLeaks get reams of information from Russian hackers,63 as they did during the recent U.S. election campaign, which also included Podesta’s hacked private emails and hacked emails from the DNC that were used to discredit the Clinton campaign.64 While the hacking was not about fake news per se, it was about Russia’s campaign to create havoc with the U.S. 2016 election. This is war by other means from Russia. It is a battlefield that has expanded because sources and means of media have increased exponentially since the days when the Soviet Union was using disinformation and propaganda to spread its message and undercut the United States and its allies during the Cold War. Russian involvement in the recent U.S. election has helped make fake news part of political discourse.65 The Russians take full advantage of this postfactual media culture and are willing to put the necessary resources into what Russia considers to be fertile ground for confrontation with the United States and the European Union.66 French poet Charles Baudelaire said, “The devil’s finest trick is to persuade you that he does not exist.”67 Russian disinformation and hacking attacks do exist. The United States and the European Union must do all they can to counter and dismantle Russian disinformation and hacking, or their institutions could be permanently undermined. There is bipartisan, bicameral support in Congress to investigate the hacking issue.68 And President Obama announced that he would look into it as well.69 These are both positive signs that the seriousness of this issue will be addressed. Limiting, at least initially, immediate goals in Syria to dealing with the humanitarian crisis. The effort to find a political solution—the constant back-and-forth between Secretary of State John Kerry and Russian Foreign Minister Sergei Lavrov—has not produced results.70 A narrower approach might have a better chance of succeeding, and if it does, it could lead to a broadening of the agenda of how to respond to the conflict in Syria. For now, the focus should be on the humanitarian catastrophe in Syria. The United States should let the Russians know it will support efforts to guarantee the delivery of supplies to innocent civilians in Syria, with military support backed by the United Nations if necessary. As part of this endeavor, the United States should lead an effort to secure a U.N. resolution that will support the use of force if necessary to get humanitarian assistance delivered. At the same time, the United States should explore the possibility of working with Russia to set up humanitarian zones in Syria, which would allow humanitarian assistance to flow to innocent civilians more freely and regularly. The neutrality and security of these zones would be guaranteed by the United Nations with U.S. and Russian support. Getting a U.N. resolution may be difficult to impossible. The recent Russian and Chinese veto of a U.N. resolution for a cease-fire in Syria to get humanitarian assistance to civilians in Aleppo is a case in point.71 If the Russians refuse efforts to ensure a steady flow of humanitarian assistance to Syria, there should be consequences. To that end, the United States has two options: working with the Europeans to impose Syria-related sanctions against Russia, and if sanctions do not get the Russians to support the effort, using NATO to protect the delivery of humanitarian aid. The Russians have said that they support making sure humanitarian assistance gets to innocent civilians in Syria and elsewhere. If it refuses the proposal to get a U.N. resolution to use force if necessary to get the aid to those in need, Russia should pay the consequences. Responding to the crisis in Ukraine necessitates a common agenda between the United States and its European allies. Although imperfect, the Minsk II agreement lays out a road map for dealing with the fighting in Ukraine. An Organization for Security and Co-operation in Europe police mission to keep the warring parties in eastern Ukraine apart should also be supported by all concerned parties. If Russia does not agree to implementing Minsk II, then increasing military assistance to Ukraine, in addition to increasing sanctions against Russia, has to be seriously considered. NATO’s modest buildup of forces in Poland and the Baltic states, as well as NATO military maneuvers, should also continue. At the same time, the illegal annexation of Crimea cannot stand, and getting Russia to reverse this act needs to be part of broader discussions between Ukraine and Russia, supported by the United States, the European Union. The cyber hacking and disinformation campaign being conducted by Russia has broader implications for U.S.-Russian relations than either of the conflicts in Syria or Ukraine. Cyberattacks and the spreading of fake news by the Russians have longer-term implications for the United States and its European allies. There needs to be a robust response by the incoming administration to the hacking supported by the Russian government and the spread of disinformation here and in Europe by Russian propaganda outlets. The response to propaganda should be both defensive and offensive. With respect to hacking, the U.S. government, working with the private sector, should engage in a public education effort to ensure that all who use the internet and social media understand the threat from Russia and others and take precautionary measures, some as simple as regularly changing passwords. At the same time, government and industry should partner to develop new, more reliable security measures. Defensive disinformation efforts should include responding to fake news stories, immediately, repeatedly, and clearly. When the facts clearly dispute conspiracy theories, as was the case with the recent confrontation at Comet Ping Pong in Washington, D.C.,72 they should be labeled as such. Even in a postfactual political and media environment, facts can still matter, perhaps more so than before. Challenging rumors, gossip, and innuendo publicly through social media is essential. The United States cannot devolve to a point where the National Enquirer is seen as a credible source of news. The Russian information war aims less at creating an alternative narrative than at throwing up a lot of smoke and dust to discredit all narratives, including the truth. Offensive efforts should be both overt and covert. If someone attacks the United States, the U.S. response should be immediate and appropriate. The United States should also work with allies in Europe and elsewhere to protect cyber infrastructure. This effort should be government to government, as well as government in partnership with the private sector. News sites and websites that regularly spread disinformation should be labeled as such, in the same way there are warnings about whether material on websites is suitable for children. Labels and filters should be developed to point out that certain websites and news sources are not credible and are purveyors of fake news. The United States will need to engage Russia, and the incoming Trump administration has to determine if it will challenge Russia where necessary in key areas that are of particular interest and importance to America. This includes Syria, where a more limited approach in response to the humanitarian catastrophe should be tried. In Ukraine, there are measures that can be taken, such as implementing Minsk II, which, while imperfect, suggests a possible way forward toward a political solution. The first step would be a cease-fire and a permanent withdrawal of Russian military personnel, regular and irregular, as well as Russian weapons. Equally important is the need to meet Russian cyber and disinformation disruptions head on. There has to be a sustained strategy by the United States and its allies that has both offensive and defensive components to challenge Russian efforts on this front. Congress has taken a lead with recent legislative action on these issues, and its role becomes more crucial with a new U.S. president who has no foreign policy experience and a predilection to be supportive of Russia’s President Putin even when his actions run counter to U.S. interests.73 Any attempt to undermine American interests, politics, political institutions, and values cannot be tolerated. There is too much at stake to do otherwise. William Danvers is a Senior Fellow at the Center for American Progress, where he works on a range of national security issues. Danvers has worked on national security issues for 35 years in the executive branch, Congress, various international organizations, and the private sector. Prior to joining the Center, Danvers was the staff director of the Senate Foreign Relations Committee for then-Sen. John Kerry (D-MA) and worked at the National Security Council and U.S. State Department during the Clinton administration. He also worked at the CIA and U.S. departments of Defense and State during the Obama administration. In addition, he served as deputy secretary-general of the Organisation for Economic Cooperation and Development in Paris, where he was responsible for relations with nonmember nations, including regional programs in the Middle East, East Asia, and elsewhere.